Much like the batteries in your smoke detectors at home, that you replace with the changing of daylight savings time whether the battery is still working or not, you don't really want to wait until the battery in your vehicle fails before you replace it. Battery Manufacturers design and engineer batteries to last 5 Years or 100,000 KMS whichever occurs first. Although your battery may not yet have failed by the 5 year/100,000 kms mark, if your vehicle is already 5 Years old or has 100,000 KMS or more and you've never replaced the battery, you are essentially operating on borrowed time. Battery Servicing throughout the life-cycle of your vehicle helps ensure that your battery is performing at peak performance and the harsh Canadian climate doesn't take its toll on your battery before its 5-year replacement window. 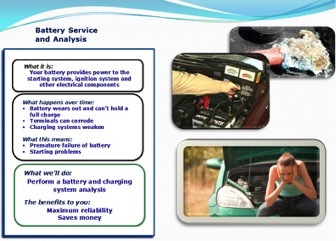 Visit AndersonKiaMenu.ca to view the Battery Service Maintenance requirements for your vehicle.